Belleek mugs are a set of four that are inspired by the Arts and Crafts movement. These Belleek mugs were introduced in 2015. These Belleek mugs were designed by Alice Jacob who was born in New Zealand of Irish parents in 1862. She returned to Ireland and studied at the Metropolitan Art College in Dublin. She became a leading figure in the Arts & Crafts movement in Ireland in the late 19th century. The movement influenced home and apparel design throughout Ireland, Britain and America. Arts & Crafts design valued natural materials, traditional craft and simpler forms, quite different from the Victorian aesthetic popular at the time. 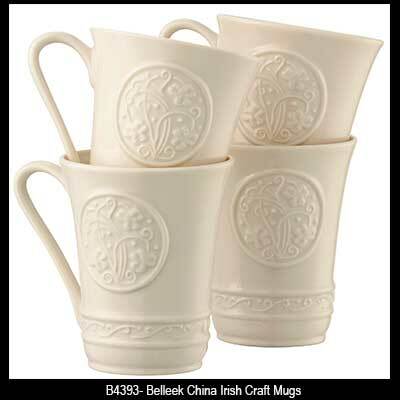 The Irish Craft mug is inspired by Belleek's artisanal heritage and the Arts & Crafts movement. 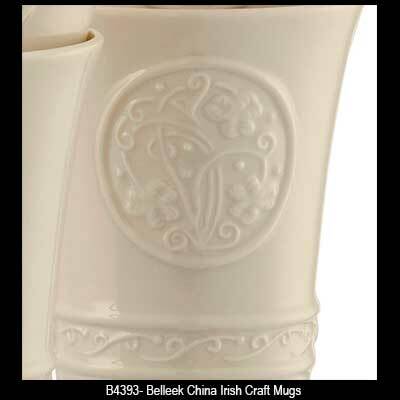 Belleek mugs feature fine Irish china that is embossed with Celtic knot work.